We motor across the smooth glacial waters of Alaska's Prince William Sound, heading into Zaikof Bay at the eastern end of Montague Island, where the island splits like whale flukes. Ahead, an incisor peak rises sharply, raking the sky. It is around 10:30 p.m., but this far north the mid-April sky holds an ethereal light, and the big mountain is awash in a rich purple cast. But what lures our eyes is the peak's immaculate west face pitching sheer and clean straight down from the summit like a giant headwall. As our two boats cruise quietly toward the head of the bay, the big Volvo Penta engines rumbling softly, most of us gather up on the flying bridges for a better view. We're tracing ski lines down the face and pointing out various approach routes when our chatter is suddenly interrupted by a loud "whooshing" sound. My friend Rich Rayhill points, then whispers, "Orcas!" I turn and look. Suddenly the glossy surface a few yards away is slashed by a five-foot-high black dagger board of a dorsal fin, and then another and another. The black and white killer whales rise and sink, rise and sink, slicing through the silky water. There are perhaps thirty whales of all ages, from six-foot calves to 30-foot patriarchs. Fully aware of us and curious, they approach the vessels as they feed and play for an hour or more. Then, as if at some signal, they turn east as one, swim off into the open sound, and vanish. It has been a day for whales. Earlier in the afternoon, after threading Upper Passage on Knight Island, we entered a realm of cetacean feeding and frolicking. At all points of the compass, we saw whales rising and sounding, their giant flukes standing out sharply against the snowy mountains beyond. For hours we just drifted, watching the immense creatures breach and spout, the gassy vapor of their exhalations hanging in the air like mist. Our expedition-to attempt to become the first to climb and ski one of Montague Island's many nameless peaks-originated several years ago. A fisherman pulled his 42-foot trawler, the Alexandra, alongside my sea kayak during a long crossing in a remote part of the sound. My group and his crew were the only human beings in hundreds, if not thousands, of square miles, and when hemoffered a lift, I thought, Why not? He introduced himself as Brad von Wichman, and as we cruised we talked seamkayaking, then somehow got on to skiing. 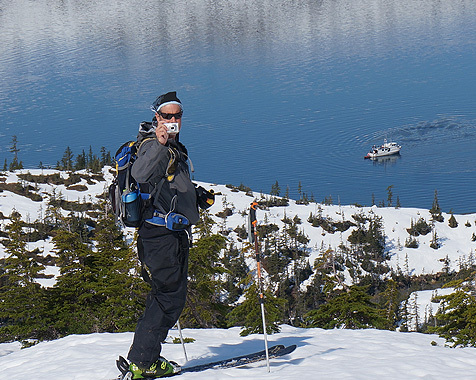 "If you love ski mountaineering, you should see this place in the spring," Brad said, urging me to return when the snowpack was measured in meters and the steep white slopes plunged straight into the cobalt sea. 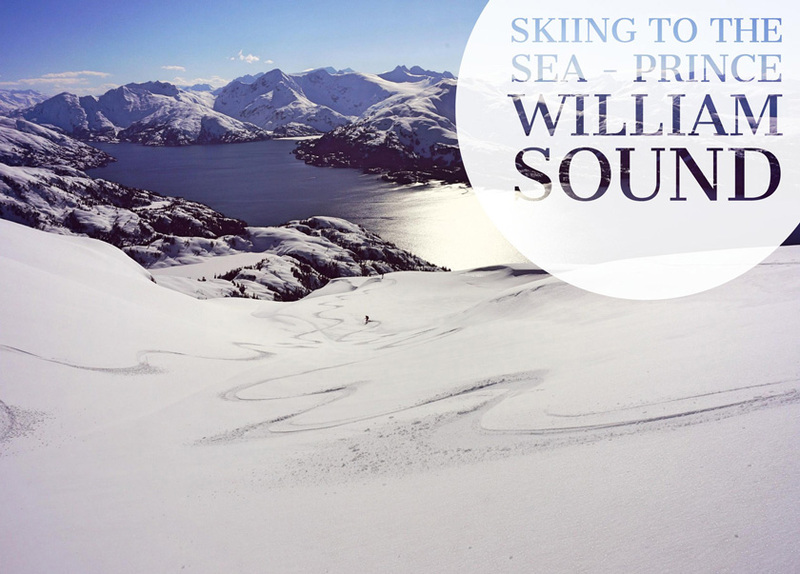 Prince William Sound is renowned as a sea kayaker's utopia. But this 15,000 square mile arm of the Pacific Ocean, with its labyrinthine network of glacially-carved fjords, is watched over by breathtaking mountains thrusting thousands of feet into the sky. The sound's 3,500 mile-long coastline reaches like an octopus deep into the snowy recesses of the Chugach and Kenai Ranges. The skiing in these peaks is virtually unexplored. But there are no roads here, the sound is enormous -the size of my home state of New Hampshire-- and to access these mountains you need a boat. When Brad and I parted, I took a last look at the Alexandra and thought, "Hell, we could base ourselves aboard that boat and ski anywhere we wanted!" So here we are on a bright Alaskan wilderness morning with not one boat, but two. The Alexandra and Brad's 58 foot charter boat Babkin serve as our transportation and our floating base camps in the wilderness. In addition we have two inflatable, motorized Zodiac skiffs for accessing shore and eight sea kayaks for après-ski paddling excursions. Banking the skiff in graceful arcs to avoid chunks of floating ice, von Wichman steers towards open water. As the skiff cuts a furrow across the placid surface, I grab my ball cap with one hand and shade my eyes with the other. Looking ahead, I study our destination for the day. Montague Island is a long, rugged, mountainous barrier guarding the southwest portion of the sound from Pacific Ocean swells. Though one of the largest islands in the United States, it's a place few people have heard of and fewer have seen. Stealing a glance at my friends perched atop a literal boatload of skis, boots, and packs, I see a half-dozen faces wearing sunglasses and silly expectant grins that no doubt mirror my own expression. Tracy Zietlow catches my eye and smiles. "It's going to be a good one," she says. Brad cuts the motor, and the skiff drifts quietly towards shore. From the upper branches of a towering spruce, a pair of bald eagles flap away. Yellow eyes glaring, the big raptors screech, venting their anger at us. We jump out and wade through yellow seaweed to a deserted beach covered with flat, shingle-like stones. Brad then turns the Zodiac around and skims quickly back to the boats. Though he is an accomplished skier, with Brad the vessels come first, and he wants to spend today tinkering with the Alexandra's engine. Once on shore I look around. There is a lot of skiing talent represented on this wild beach. Edda is a former member of the German Olympic ski team; Brad's wife Kjersti von Wichman was on the Norwegian World Cup Alpine team and later coached the U.S. Ski Team, and Anna Kari is a former Norwegian cross-country ski champion. Tracy, Jim, Richard, and Brad's sister, Alex, were all top-ranked collegiate ski racers, and Rob is on the ski patrol at Alyeska Ski Resort. We know each other through the von Wichmans; many of us have traveled together before; and over the last several days of skiing and sailing, we have gelled as a group and become good friends. Ski boots and packs on, avalanche beacons transmitting, we kick steps and climb the seven foot snow-wall at the high tide line. 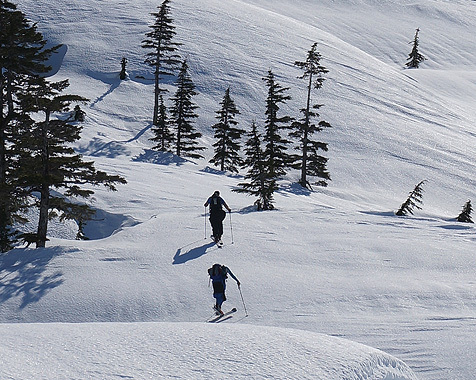 On top we snap into our telemark bindings, slip through a gap in the coastal rainforest, and ski off into the unknown. There are no trails, so we thread our way under towering trees through thickets of spiny devils club, a tall plant bristing with thorns. We ski across snow bridges, and we use fallen trees to span streams swollen with snowmelt. As the going gets steep our eyes start to sting with sweat and our muscles burn. 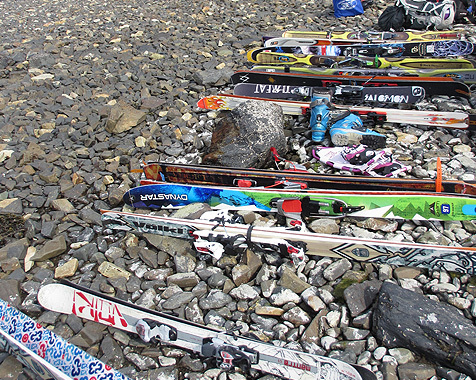 To ski across the flats and to ascend the steep slope, we attached climbing skins to the bottom of our skis. In the old days, climbing skins were just that: ski-length strips of animal hide that skiers attached to the bottom of their skis. With the hairs pointing toward the tail of the ski, the skins gave the skis a tenacious grip on steep uphills when the skier pressed down on the ski. At the top the skier simply ripped the hides from the bottoms of his skis and continued on his way. Today, climbing skins are made of synthetic fibers, but they perform the same function as the original hides. As the ski glides forward, the hairs provide little resistance. If the ski starts to slip backwards, the hairs dig into the snow and hold. Without skins, the peak we are climbing would be inaccessible. We break out of the trees, taking turns in the lead, stretching a long thin track across the dazzling white. The sun is brilliant. Daggers of light glint off the snow surface and stab at our eyes through our dark glasses. The route steepens, we crest a ridge, and a massive bowl rimmed by heavily corniced ridges expands before us. Some of the cornices have cracked off and bombed the mountain flanks, creating catastrophic avalanches, obliterating the slopes below. But there is no cornice above our giant west face, which is extremely steep but flawless. We ski towards the base of our peak to assess the avalanche risk. Rob Durnell, the patroller from Alyeska, directs us in digging a pit. We go down six feet, eight feet, deeper, finding nothing of concern. "The slope's solid," Rob declares. "Let's do it!" Halfway up the face I stop and peer down between my feet and I can see Anna Kari directly below me. I glance up and see the bottom of John Durham's ski boots ten feet above. He looks down and grins. "Ayuh, she's gittin' kinda steep," he deadpans in his best Downeast Maine brogue. I stare off to the north where the sharply canted white slope intersects the perfectly level blue horizon of the sound at an exact 45-degree angle. Rob confirms my estimate with his inclinometer. The pitch gets quite a bit steeper yet at the top as I scramble the last few yards to the summit. From up here the view is of the sapphire sea and ice-choked fjords backed by endless rows of scalloped ridges, sawtooth mountains, and tidewater glaciers. For a moment I'm lost in contemplation. My trance is interrupted by the crackle of my VHF radio. "Steve, you there?" "Yeah Brad, go ahead." "You guys might want to take your time on the way back to the boats," Brad says in his matter-of-fact voice. "There's a giant brown bear down at the beach where I dropped you off. I'd say he goes over a thousand pounds, easy. These Montague bears are real aggressive, and I'm guessing this guy just woke up from hibernation. He's probably hungry and cranky as hell. I'm scoping him with the binoculars right now. He's sniffing your rubber boots, getting your number. Watch your back." "Thanks pal," I say, looking down at the Babkin tugging at her anchor chain in the safety of Zaikof Bay below. Though she is only a couple of miles away, the distance between us now seems vast. I tick off the potential hazards that separate us: Avalanches. Extreme steeps. Grizzlies! "All in a day's work, Brad. We'll keep an eye out for him." When I launch over the lip I feel as If I'm jumping out the window of a tall building. The face feels dead vertical. But once I land the first turn, pressure my rear foot, and feel the skis bite into the soft snow, my feelings change from apprehension to pure exhilaration. With greater confidence I face straight down the slope. At every turn I angle my skis closer to the fall-line. Within moments I feel the joyous sensation of near flight as I rocket down the slope, slashing quick turns left and right, going faster, faster. I finally pull up, stopping at treeline to catch my breath. My legs are on fire. Another first descent. Looking up I watch Tracy, then Anna Kari, then Kjersti, carve up the slope with beautiful sinuous lines. In a day or two our traces will fade and no one will ever know we were here, which is exactly how we want it. But as we ski down through the tall trees, we cross another set of fresh tracks. The size of dinner platters, with claw marks extending a good four inches out in front, we have no doubts about who made them. "Hey, comes with the territory," I say with more cheer than I feel as we hastily bushwhack down through the fallen timber and the evil devils club. There are giant bear tracks everywhere. Rich Rayhill looks over his shoulder dramatically, then intones "We are not alone." You wanted an adventure, I think. Well, you've got one. Some dreams come true, and every day of this expedition we have summited an unclimbed peak and cut first-ever tracks down steep faces and rollicking couloirs. In the evenings we have launched sea kayaks and explored hidden coves and glaciers. Our world seems new, filled with endless possibilities for adventure, and everywhere I look I see jagged peaks rising from the sea all across the horizon, beckoning. In that vast, incomprehensible distance there are no other signs of humanity. In an age of satellite links, geographical positioning systems, cell phones, and the Internet, it's harder and harder to get away, to find genuine terra incognita to explore, to have a singularly authentic experience. Here in Alaska it's still possible to be truly challenged mentally and physically, to rely utterly upon careful preparation, honed skills and acquired wisdom. So far our little band of Argonauts has passed each test the wild has tossed at us, and every day we have felt that bracing sensation of being the first. And as I ski down through the thick timber to the beach, I watch my back until Brad fires up the Zodiac and brings us back to camp.